I have always considered myself very fortunate to be part of the Gardens' horticulture team, but right now, as part of the team creating the new Darlene Radichel Plant Select Garden, I feel it even more so. This new garden, located on the former site of the Monet Garden, will showcase the many plants selected and promoted by the Plant Select program since its inception 10-15 years ago. These are plants which are unusually wel l-suited to thrive in our area, our soils, and our climate supporting home-owners in their quest to garden beautifully within the scope of our region's available resources. Like many, I was sad to see the Monet Garden go. But its multitude of perennials, roses, trees, and decor now enhance so many other parts of the Gardens, and working to bring this new garden to life in its place has made me very enthusiastic about this new garden opportunity. As you can see in this photo, the structure of the new garden is already established replete with new irrigation, pathways, lighting and beautiful stone walls. In the next month or so you will see the pergola erected providing shady seating overlooking the nearby pond with its beautiful waterlilies, more soil brought in to vary and complete the terrain and, finally, the plant installation itself. 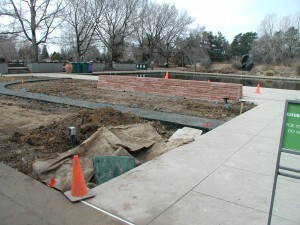 Stop by periodically to watch this garden take shape alongside the many other new and blossoming spaces here at the Gardens. To learn more about Plant Select and its plants click here.